Starting this year we will be implementing 1 week lessons for each class! You will now have 4 weeks to choose from throughout the summer. Classes still meet the required Red Cross class duration time, students will just complete their course in the 1 week period. Also, Lane Swim will now be Thursday mornings from 7:00 a.m.-8:00a.m. Aquasize will still be held Tuesday evenings at times to be determined. Please pass this information on to those you know wishing to register for lesson time. Registration will be at the Balgonie Multiplex on Sunday May 26th from noon-2:00 p.m. Please ensure your 2019 registration form is completed. There will be no phone registration. No post dated cheques accepted. If you miss registration, you will have to go directly to the pool office to register. The pool will be opening for the season on June 8th, 2019. More information on the Swimming Pool page. 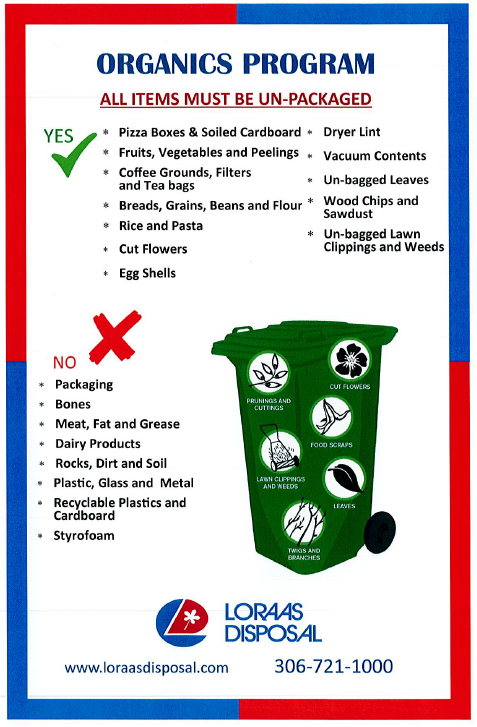 This April, the Town of Balgonie will begin the curb side composting program. Your cart will arrive April 4th, 2019 and the first pick up will be April 15th, 2019. As with the other carts, please have them on the curb side on MONDAYS by 7:00 am. This will be a weekly pick-up program from April until November, with a monthly pick-up in the winter months. In case they get mixed up during a wind storm, we are also asking residents to help us out by using a black marker and writing your home address on the back of these bins as the serial numbers are recorded to your address. Thank you for your support in our environmental efforts. Today, Ralph Goodale, Minister of Public Safety and Emergency Preparedness, on behalf of Amarjeet Sohi, Minister of Infrastructure and Communities, and Indian Head-Milestone MLA Don McMorris on behalf of Government Relations Minister Donna Harpauer, announced funding for an estimated $6.4 million expansion for the Town of Balgonie’s wastewater system to better serve the community and position it for growth. 5:00 – 7:00 pm – Come and go supper. Each guest will receive a basket of wings, a slice of pizza and a beverage of your choice. 6:00 – 7:00 pm – Greenall High School’s R&B Band performance. 7:00 – 7:30 pm – Small program. 7:30 – 1:00 am – Recorded music and dance, cash bar. 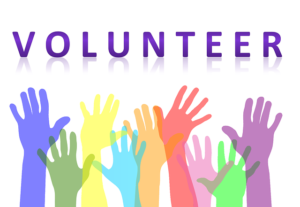 In honour of all those who volunteer their time – whether it be coaching the many sports in and around town, organizing events such as dinner theatres, tournaments, recitals, helping with the planning of any type of meeting, and fundraising events – to those who just help keep our community clean, the Council of Balgonie wants to thank you! Please join us for an evening to thank you for the volunteerism you and your family have done for our community. Guest will also be entered into a draw for a Saskatchewan Rough Riders Jersey. We ask that you kindly RSVP to the Town, to ensure that there is enough food for all to enjoy. Public notice is hereby given that the Council of the Town of Balgonie intends to adopt a bylaw, under The Planning and Development Act, 2007, to amend Bylaw No. 374/2014, known as the Zoning Bylaw. INTENT: The proposed bylaw will amend the development regulations in RI and R2 zoning to reduce the site area and side yard set-backs for adjoining housing units. REASON: The reason for the bylaw amendment is to accommodate the subdivision of duplex and triplex condominium units. PUBLIC INSPECTION: Any person may inspect the bylaw at the Town of Balgonie Municipal Office Monday to Friday between 9:00 am to noon and 1:00 pm to 5:00 pm excluding statutory holidays. Copies are available at cost at the Municipal Office. 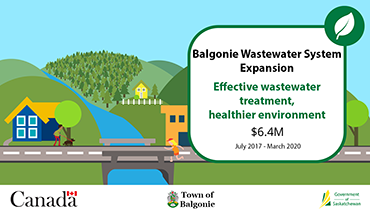 PUBLIC HEARING: Council will hold a public hearing to receive submissions on the proposed bylaw on Monday, March 25, 2019 at 7:00 p.m. at the Town of Balgonie Council Chambers. Council will also consider written submissions received at the hearing or delivered to the undersigned at the municipal office before the hearing. For further information, please contact the Municipal Office at 306-771-2284. Issued at the Town of Balgonie, this 28th day of February, 2019.